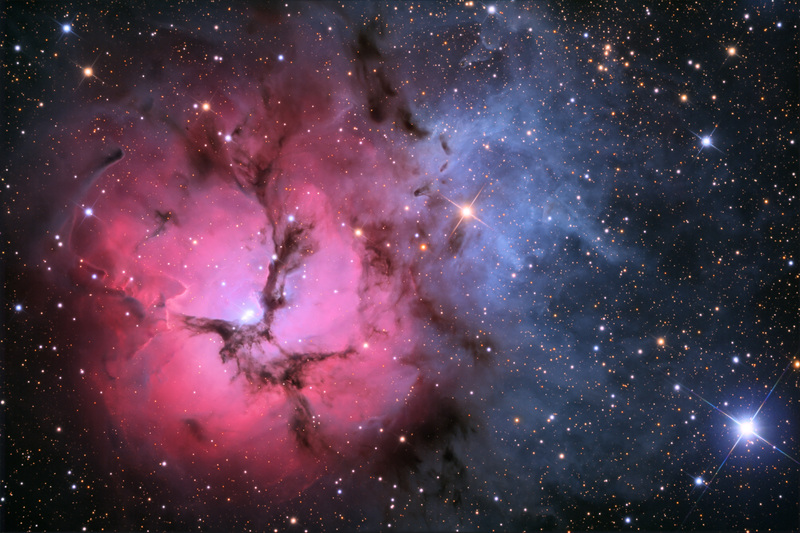 Unspeakable beauty and unimaginable bedlam can be found together in the Trifid Nebula. Also known as M20, this photogenic nebula is visible with good binoculars towards the constellation of Sagittarius. The energetic processes of star formation create not only the colors but the chaos. 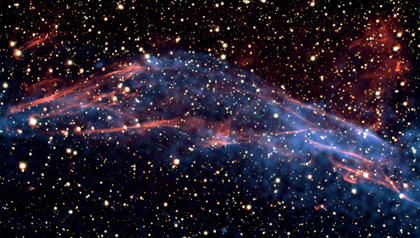 The red-glowing gas results from high-energy starlight striking interstellar hydrogen gas. The dark dust filaments that lace M20 were created in the atmospheres of cool giant stars and in the debris from supernovae explosions. Which bright young stars light up the blue reflection nebula is still being investigated. The light from M20 we see today left perhaps 3,000 years ago, although the exact distance remains unknown. Light takes about 50 years to cross M20. This beautiful image gives a new look at Stephan’s Quintet, a compact group of galaxies discovered about 130 years ago and located about 280 million light years from Earth. The curved, light blue ridge running down the center of the image shows X-ray data from the Chandra X-ray Observatory. Four of the galaxies in the group are visible in the optical image (yellow, red, white and blue) from the Canada-France-Hawaii Telescope. A labeled version identifies these galaxies (NGC 7317, NGC 7318a, NGC 7318b and NGC 7319) as well as a prominent foreground galaxy (NGC 7320) that is not a member of the group. The galaxy NGC 7318b is passing through the core of galaxies at almost 2 million miles per hour, and is thought to be causing the ridge of X-ray emission by generating a shock wave that heats the gas. Additional heating by supernova explosions and stellar winds has also probably taken place in Stephan’s Quintet. A larger halo of X-ray emission – not shown here – detected by ESA’s XMM-Newton could be evidence of shock-heating by previous collisions between galaxies in this group. Some of the X-ray emission is likely also caused by binary systems containing massive stars that are losing material to neutron stars or black holes. Stephan’s Quintet provides a rare opportunity to observe a galaxy group in the process of evolving from an X-ray faint system dominated by spiral galaxies to a more developed system dominated by elliptical galaxies and bright X-ray emission. Being able to witness the dramatic effect of collisions in causing this evolution is important for increasing our understanding of the origins of the hot, X-ray bright halos of gas in groups of galaxies. 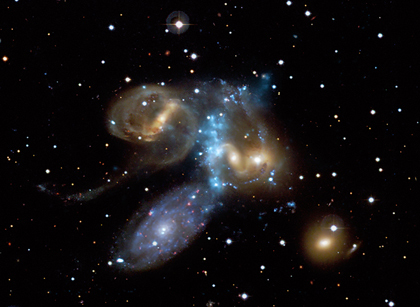 Stephan’s Quintet shows an additional sign of complex interactions in the past, notably the long tails visible in the optical image. These features were probably caused by one or more passages through the galaxy group by NGC 7317. Connecting the Pipe Nebula to the colorful region near bright star Antares is a dark cloud dubbed the Dark River, flowing from the picture’s left edge. Murky looking, the Dark River‘s appearance is caused by dust obscuring background starlight, although the dark nebula contains mostly hydrogen and molecular gas. Surrounded by dust, Antares, a red supergiant star, creates an unusual bright yellowish reflection nebula. 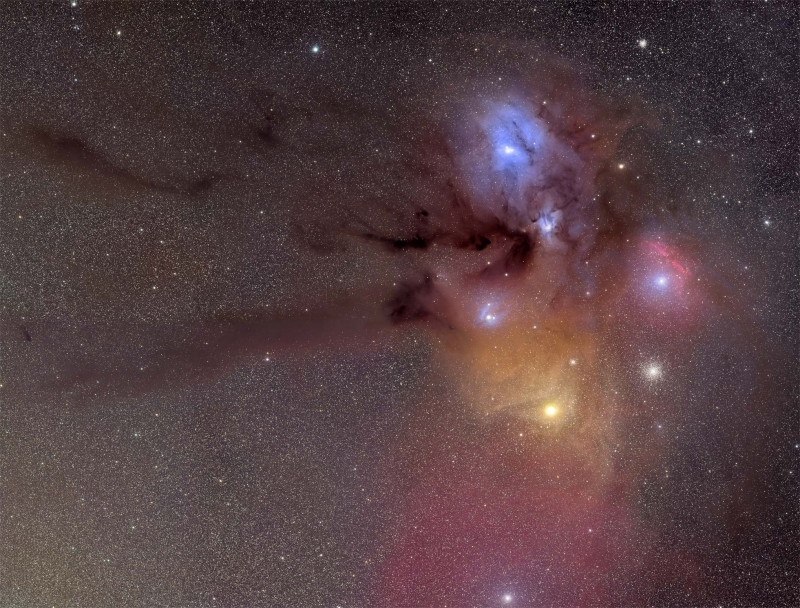 Above it, bright blue double star Rho Ophiuchi is embedded in one of the more typical bluish reflection nebulae, while red emission nebulae are also scattered around the region. Globular star cluster M4 is just seen above and right of Antares, though it lies far behind the colorful clouds, at a distance of some 7,000 light-years. The Dark River itself is about 500 light years away. The colorful skyscape is a mosaic of telescopic images spanning nearly 10 degrees (20 Full Moons) across the sky in the constellation Scorpius. Optical: ESO/E. Helder; X-ray: NASA/CXC/Univ. of Utrecht/J.Vink et al. Using Chandra, growing supermassive black holes have been discovered in a sample of blobs, immense reservoirs of hydrogen gas located in the early Universe.These black holes and bursts of star formation are believed to be illuminating and heating the gas in the blobs. This represents a “coming of age” for the galaxies and black holes as they start to switch off their rapid growth. This image of data from NASA’s Chandra X-ray Observatory and the European Southern Observatory’s Very Large Telescope shows a part of the roughly circular supernova remnant known as RCW 86. This remnant is the remains of an exploded star, which may have been observed on Earth in 185 AD by Chinese astronomers. By studying this remnant, a team of astronomers was able to understand new details about the role of supernova remnants as the Milky Way’s super-efficient particle accelerators. The team shows that the shock wave visible in this area is very efficient at accelerating particles and the energy used in this process matches the number of cosmic rays observed on Earth. The VLT data (colored red in the composite) was used to measure the temperature of the gas right behind the shock wave created by the stellar explosion. Using X-ray images from Chandra (blue), taken three years apart, the researchers were also able to determine the speed of the shock wave to be between one and three percent of the speed of light. The temperature found by these latest results is much lower than expected, given the measured shock wave’s velocity. The researchers conclude that the missing energy goes into accelerating the cosmic rays.